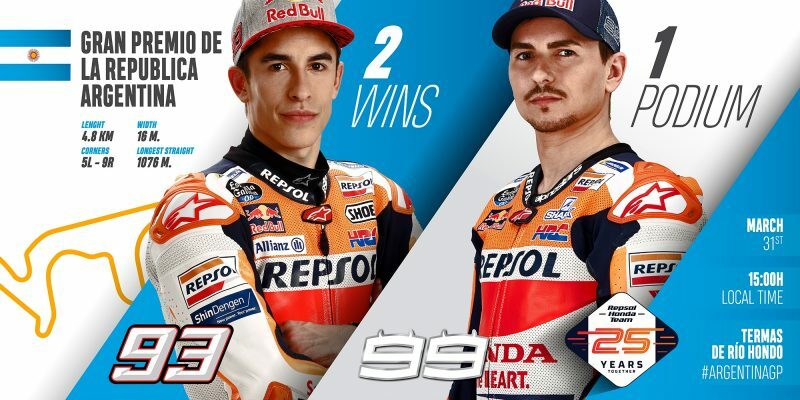 With the first race of 2019 under their belts, Repsol Honda Team riders Marc Marquez and Jorge Lorenzo are ready to continue building. Joining the calendar in 2014, the Argentina Grand Prix at the Termas de Rio Hondo circuit is one of the longest races in the championship at over 120 kilometres across 25 laps. Characterised by multiple long staights, demanding left-hand corners and often-unpredictable weather, the race has produced five different premier class winners in six years. Opening his 2019 MotoGP™ World Championship campaign in an almost identical fashion to 2018, Marc Marquez battled Andrea Dovizioso until the line in Qatar. Walking away with 20 points, the reigning MotoGP™ World Champion began his title defense with a solid result. Now awaits the Termas de Rio Hondo circuit where Marquez has achieved two wins previously, the only premier class rider to win there more than once. For Jorge Lorenzo, the Argentina GP will be about continuing to learn and adapting to the Repsol Honda Team RC213V. After a physically punishing weekend, where it was later revealed he had sustained a fissure to one of his ribs, Lorenzo and the team are aiming for a smooth weekend to again unlock the potential shown on Friday in Qatar. The weekend begins at 12:00 local time with the pre-race press conference where Marc Marquez will once again be in attendance. On track action starts on Friday, March 29 at 10:50 Local time with Free Practice 1, lights going out on the race at 15:00 local time on Sunday, March 31.